Police in Bolivia have arrested a fourth suspect after an attack on a radio presenter who was set alight by masked men while he was live on air. Three men were detained shortly after Monday's attack on Fernando Vidal. Police said they were able to locate the suspects thanks to a witness who had written down the licence plate number of their getaway car. Government officials said Mr Vidal's outspoken criticism of smuggling had likely been the motive for the attack. Yacuiba, where the attack took place, is only three kilometres (less than two miles) from the Argentine border. And while there is a high-volume of cross-border commerce, journalists such as Mr Vidal have been denouncing a rise in smuggling, particularly of liquid petroleum gas. Government minister Carlos Romero said he believed the suspects had been hired to carry out the attack and that the search for those who had ordered it continued. Mr Vidal, who owns Radio Popular as well as working as a journalist and presenter at the station, was in the studio on Monday when four masked men forced their way in and threw petrol bombs. They also poured petrol over Mr Vidal and set him alight. 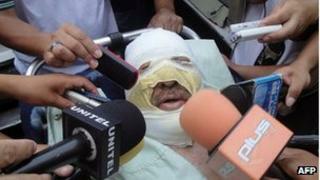 Mr Vidal suffered severe burns on his face, arms and chest. Studio technician Karen Anze was also injured. The attack caused outrage both in Bolivia and at an international level, with organisations such as Amnesty International and Reporters without Borders condemning it.